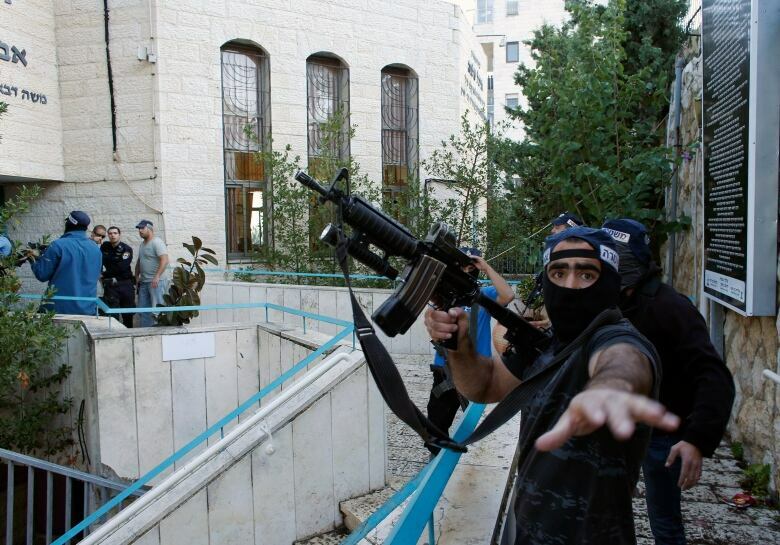 Two Palestinians stormed a Jerusalem synagogue on Tuesday, attacking worshippers inside with meat cleavers and a gun, leaving five dead and several injured, including a Canadian-Israeli citizen. The attackers died in a shootout with police. Prime Minister Benjamin Netanyahu vowed Israel will "respond harshly" to the attack, describing it as a "cruel murder of Jews who came to pray and were killed by despicable murderers." The injured Canadian has been identified as Howie Chaim Rothman, CBC's Derek Stoffel reported. He was in serious condition in a Jerusalem hospital. No other details were immediately available. Four of the dead were rabbis and one was a police officer who died of his wounds hours after the attack. Three of the rabbis were born in the United States and the fourth was born in England, although all held dual Israeli citizenship. Five others were injured. Netanyahu ordered that the homes of the attackers be destroyed. Israel halted its much-maligned practice of home demolitions in 2005 after officials determined it was not an effective deterrent. But the government had a change of heart recently and revived the tactic in certain cases. Palestinian President Mahmoud Abbas condemned the attack, the first time he has done so since a recent spike in deadly violence against Israelis began. He also called for an end to Israeli "provocations" surrounding the sacred site. In a statement, Abbas's office said he "condemns the killing of the worshippers in a synagogue in west Jerusalem." The statement called for an end to the "invasion" of the mosque at the holy site and a halt to "incitement" by Israeli ministers. Israeli police called the incident a terrorist attack and said the two Palestinian assailants were cousins from east Jerusalem. The Popular Front for the Liberation of Palestine, a militant group, said the cousins were its members. A PFLP statement did not specify whether the group instructed the cousins to carry out the attack. Hamas, the militant Palestinian group that runs the Gaza Strip, praised the attack. Avraham Goldberg, 68, a native of Liverpool. Aryeh Kupinsky, 43, a U.S. native. Kalman Ze'ev Levine, 55, a U.S. native. Moshe Twersky, 59, a native of Boston. Associated Press footage from the scene showed the synagogue, in Jerusalem's ultra-Orthodox Har Nof neighbourhood, surrounded by police and rescue workers following the attack. Wounded worshippers were being assisted by paramedics and a bloodied meat cleaver lay near the scene of the attack. "I tried to escape. The man with the knife approached me. There was a chair and table between us … my prayer shawl got caught. I left it there and escaped," Yossi, who was praying at the synagogue at the time of the attack, told Israeli Channel 2 TV. He declined to give his last name. Yosef Posternak, who was at the synagogue at the time of the attack, told Israel Radio that some 25 worshippers were inside when the attackers entered. "I saw people lying on the floor, blood everywhere. 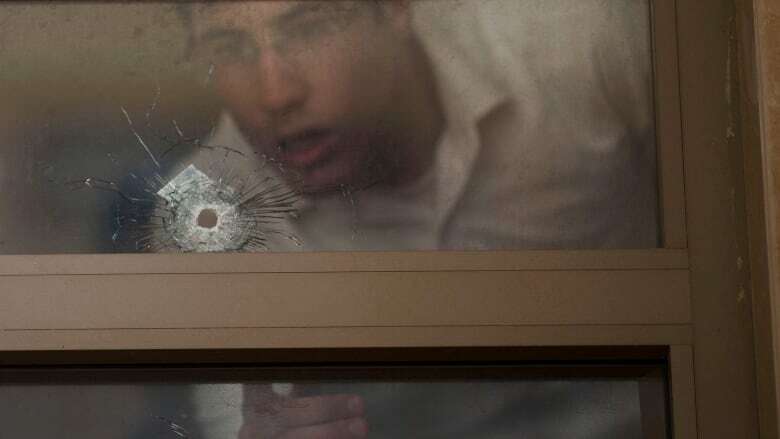 People were trying to fight with [the attackers] but they didn't have much of a chance," he said. Police spokeswoman Luba Samri said the attackers were Palestinians from East Jerusalem, which has been the scene of relentless clashes between Israeli police and Palestinian protesters in recent months. She identified the assailants as Ghassan and Oday Abu Jamal from the Jabal Mukaber neighbourhood. 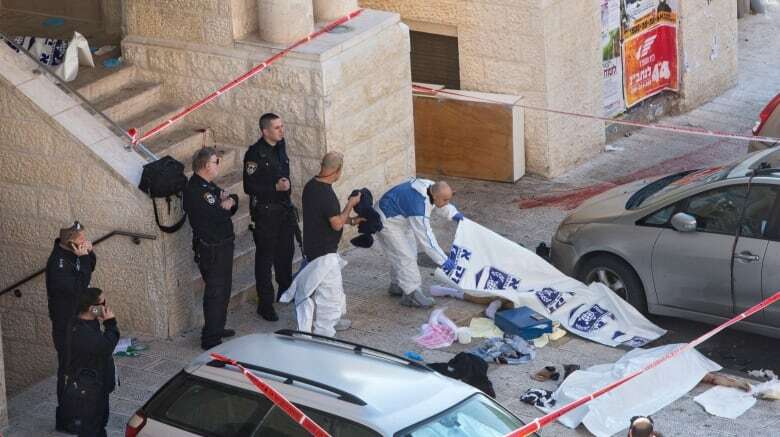 Soon after the attack, clashes broke out outside the Abu Jamals' home where dozens of police had gathered to carry out arrests in connection with the attack. Residents hurled stones at police who responded using riot dispersal weapons. Israel has been on edge with a spate of attacks by Palestinians against Israelis, killing at least six people in Jerusalem, the West Bank and Tel Aviv in recent weeks, prior to Tuesday's casualties. Jerusalem residents had already been fearful of what appeared to be lone-wolf attacks using cars or knives against pedestrians, but Tuesday's synagogue assault harkens back to gruesome attacks during the Palestinian uprising of the last decade. Israel's police chief said Tuesday's attack was likely not organized by militant groups, similar to other recent incidents, making it more difficult for security forces to prevent the violence. "These are individuals who decide to do horrible acts. It's very hard to know ahead of time about every such incident," Yohanan Danino told reporters at the scene. Tensions appeared to have been somewhat defused last week following a meeting between Netanyahu, Kerry and Jordan's King Abdullah II in Amman. The meeting was an attempt to restore calm after months of violent confrontations surrounding a sacred shrine holy to both Jews and Muslims. Israel and the Palestinians said then they would take steps to reduce tensions that might lead to an escalation. In his statement, Netanyahu blamed the violence on incitement by both Hamas and Palestinian President Mahmoud Abbas and said the international community ignores the incitement. Kerry blamed the attack on Palestinian calls for "days of rage," and said Palestinian leaders must take serious steps to refrain from such incitement. He also urged Palestinian leaders to condemn the attack "in the most powerful terms." "Innocent people who had come to worship died in the sanctuary of a synagogue. They were hatcheted, hacked and murdered in that holy place in an act of pure terror and senseless brutality and murder," Kerry said. British Foreign Secretary Philip Hammond, speaking alongside Kerry, also condemned the violence. Hamas's statement praised the synagogue attack, saying it was a "response to continued Israeli crimes, the killing, desecrating al-Aqsa (mosque)," a reference to a recent incident at the holy site. Much of the recent violence stems from tensions surrounding the Jerusalem holy site referred to by Jews as the Temple Mount because of the Jewish temples that stood there in biblical times. It is the most sacred place in Judaism; Muslims refer to it as the Noble Sanctuary, and it is their third holiest site, after Mecca and Medina in Saudi Arabia. The site is so holy that Jews have traditionally refrained from going there, instead praying at the adjacent Western Wall. 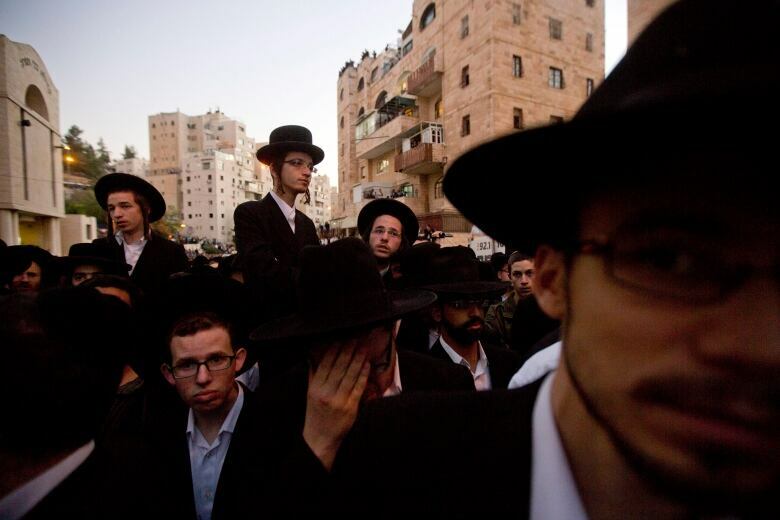 Israel's chief rabbis have urged people not to ascend to the area, but in recent years, a small but growing number of Jews, including ultranationalist lawmakers, have begun regularly visiting the site, a move seen as a provocation. In Ottawa, Foreign Affairs Minister John Baird said Canada condemns the attack "in the strongest possible terms." “Attacks on innocent worshippers, in what is supposed to be a place of peace and tranquility, are cowardly and must never be tolerated," he said in a statement. In Toronto, the Centre for Israel and Jewish Affairs also issued a statement condemning the attack. It added: "An entire generation of Palestinian children is being raised to hate Jews and encouraged to commit suicide attacks. 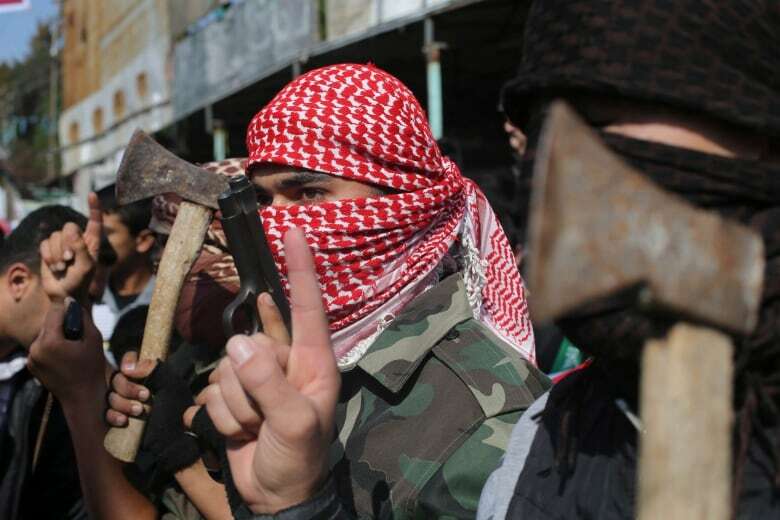 Palestinian incitement to hatred and violence must stop." An earlier version of this story named the injured Canadian-Israeli citizen as Chaim Howard Rothman. In fact, his name is Howie Chaim Rothman.